What kind of candies you decide to top it with is up to you. I chose a variety like jelly beans, sprinkles, chocolate eggs, gummy bunnies, and candy coated chocolates. Once I started snacking on this treat, I had a hard time stopping! I won’t tell you how much I ate on my own (too embarrassed to release that information) but I gave the rest to a friend and her family. Thank goodness for friends & family who love sweets because I always have way too many here to eat by myself! What is your favourite Easter candy? I’d have to choose the Hershey’s Eggies (similar to Mini Eggs – the candy coated chocolate). That’s one thing I can’t have in the house or I’ll eat them until I get a belly ache. That or raisins – which my friends make fun of me for. Ha! I don’t know what it is about raisins but they are my favourite sweet treat! Not chocolate coated raisins – just plain raisins. Yum! variety of Easter candies like gummy bunnies, chocolate coated candies, pastel sprinkles, jelly beans, Mini Eggs, etc. Place a single layer of graham crackers on the cookie sheet. Spread the marshmallow fluff evenly over the graham crackers. This is a sticky process so you can use a little water on a spatula to help evenly spread the marshmallow fluff. Melt the chocolate chips in the microwave. Microwave on 30 second intervals, stirring well after each 30 seconds. You want the chocolate melted but not really hot. Spread the melted chocolate evenly over the marshmallow fluff. 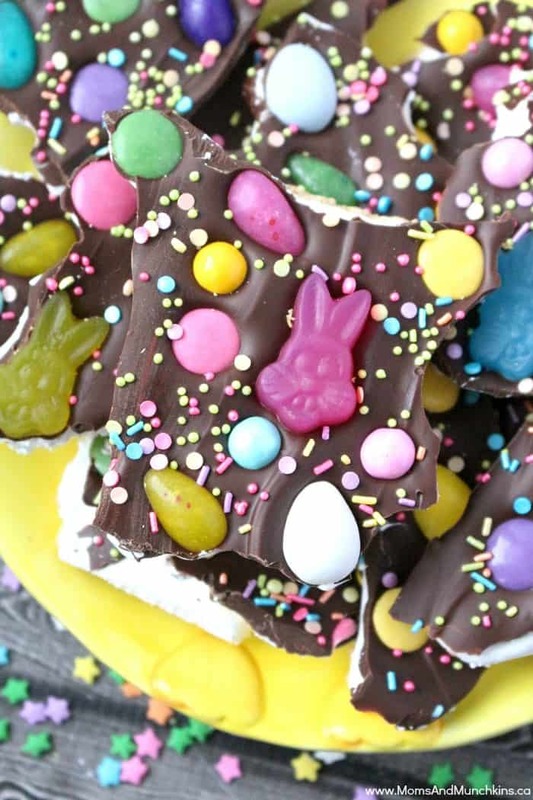 While the chocolate is still melted, start topping it with a variety of Easter candies. 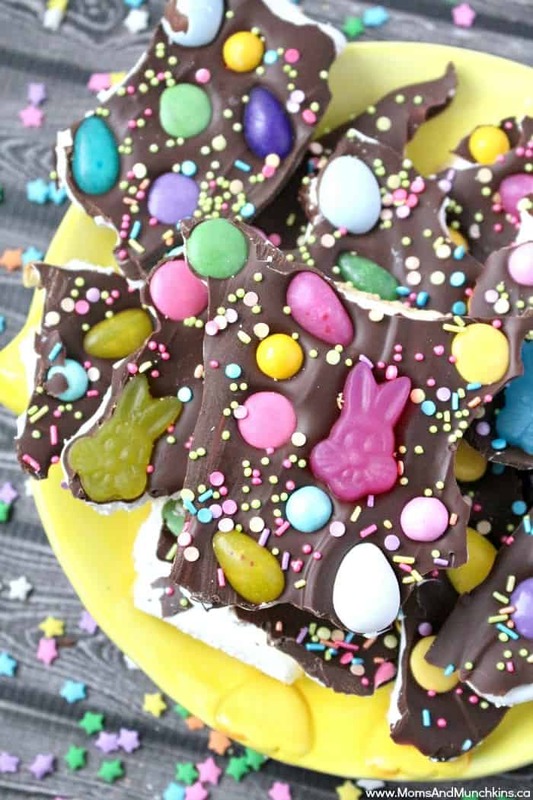 Place the Easter Bark in the fridge until the chocolate has completely hardened (at least a couple of hours or even let it sit overnight). 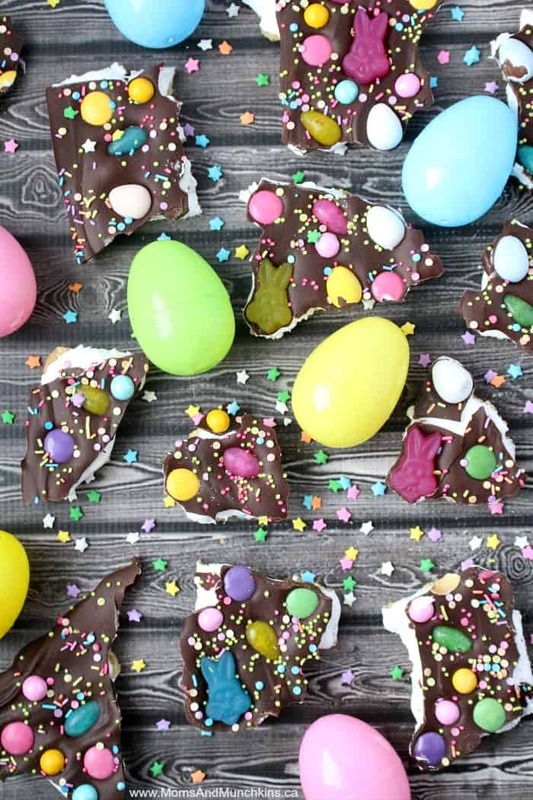 Once the chocolate has hardened, you can break the Easter Bark into pieces then store it in a food storage bag in the refrigerator. 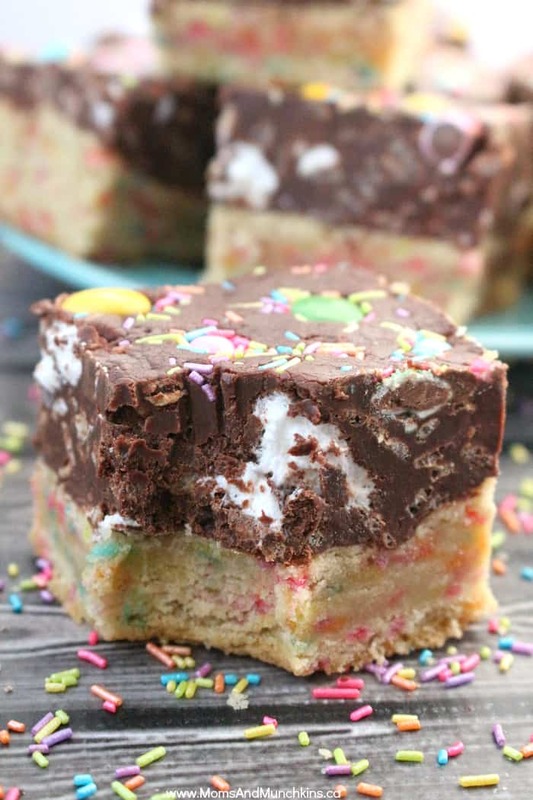 Easter Fudge Sugar Cookie Bars – it’s just like it sounds, fudge on top of a sugar cookie base. Lots of sprinkles, candies and marshmallow Peeps in this dessert! 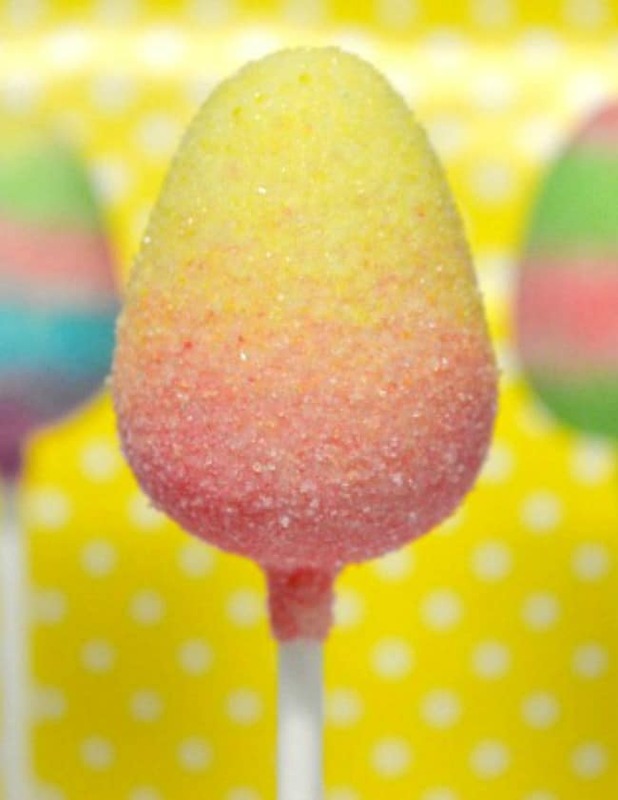 Easter Egg Cake Pops – these creations (by our contributor Deanna) are a big hit within her circle of family & friends. She walks you through the steps of creating these sweet treats and it looks fairly easy to do. 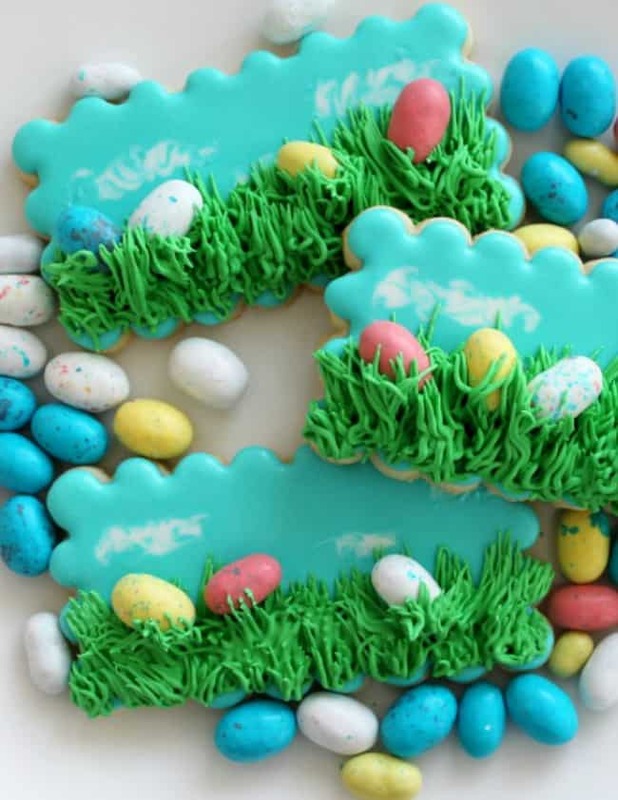 Easter Scavenger Hunt Cookies – a fun cookie decorating tutorial by our contributor Amy. 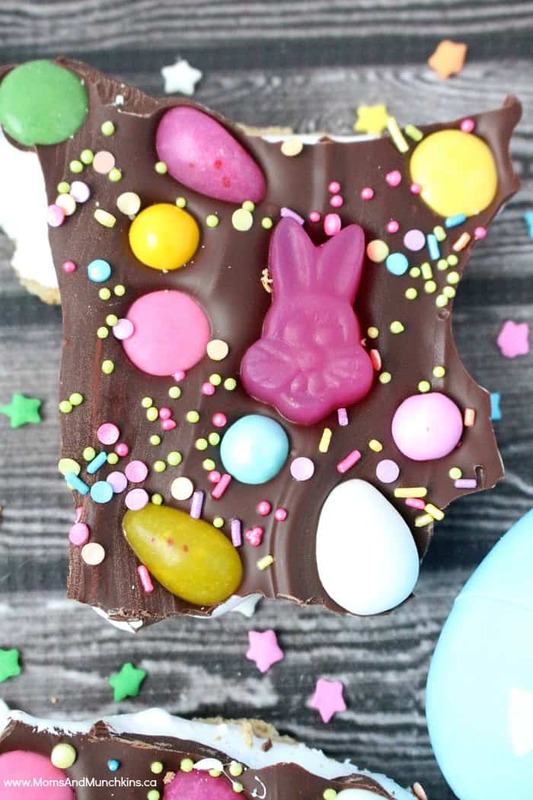 Such a cute idea for an Easter party favour! For more tasty treats, party ideas, free printables and more, visit our Easter page. Stay updated on the latest ideas by following us on Facebook, Twitter, Instagram and Pinterest.